SACRAMENTO, California, December 27, 2012 (ENS) – The California Air Resources Board has approved Honda’s first plug-in hybrid as the first car that meets the state’s newest and most stringent smog-emission standard. The 2014 Honda Plug-In Hybrid Accord is the first gasoline-powered car to meet California’s SULEV20 standard, the toughest in the nation and one-third cleaner than the previous lowest state standard. This Honda model has lower greenhouse gas emissions than the fleet average standard required by all cars in 2025, the equivalent of a 50 percent reduction from current required levels. “Honda has demonstrated that a dedicated commitment to the environment and advanced engineering at every level of the company can deliver the cleanest cars well ahead of schedule,” said Tom Cackette, the Board’s deputy executive officer and head of its mobile source program. The Air Resources Board Executive Order allowing Honda to sell the newly certified ultra-clean cars in California was signed on December 21, following a detailed examination of emissions and performance test results. Honda began production of the car the same day. 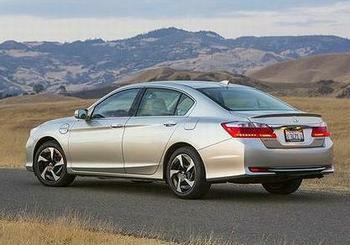 The 2014 Honda Accord Plug-In Hybrid will be on sale in California and New York on January 15, 2013. The 2014 Accord Plug-in Hybrid is powered by Honda’s first two-motor hybrid system, and uses a new Earth Dreams 2.0-liter i-VTEC 4-cylinder engine producing 137 horsepower, teamed with a 124-kilowatt electric motor. Electric driving is supported by a 6.7 kilowatt-hour lithium-ion battery. The full-size sedan model achieves 124 MPGe city / 105 MPGe highway in hybrid mode, and 47 miles per gallon city / 46 miles per gallon highway in gas only mode. In its default upon start-up, the Accord PHEV acts as a pure electric vehicle and will continue in full-electric mode until battery capacity requires the automatic switch to gas/electric hybrid operation. At higher speeds or under high demand for acceleration, the gasoline engine kicks in to provide additional power. When the car’s low battery charge indicator comes on, drivers can plug into a 120-volt outlet and be fully charged in three hours. With a 240-volt outlet, a charge takes less than one hour, the company says. The 2014 Honda Accord Plug-In comes with safety features such as Honda LaneWatch™, forward collision warning and lane departure warning. The low emissions standards that this Honda model meets are part of the state’s Advanced Clean Cars package of regulations, adopted in January 2012, that are intended to ensure increasingly cleaner cars for sale in the state, and provide for increased choices of zero-emission vehicles. When fully in force in 2025, the new set of standards will reduce smog-causing pollutants from low-emission vehicles 75 percent from current levels, and greenhouse gases by 34 percent. “Once again, Honda is the first to comply with ARB’s most stringent standard,” said Cackette. Honda has a history of being the first manufacturer to comply with California’s strict emission standards. In 1995, the 1996 Honda Civic was the first certified Low Emission Vehicle (LEV) gasoline vehicle. In 1997, the 1998 Accord was the first ultra-low emission vehicle (ULEV) gasoline vehicle. The following year, in 1999, the 2000 Accord was the first certified Super Ultra-low Emission Vehicle (SULEV) gasoline vehicle. In 2001, the 2001 Civic GX, powered by compressed natural gas, was the first certified Advanced Technology Partial Zero-Emission Vehicle (AT PZEV). In 2002, the 2003 Civic Hybrid was the first certified Advanced Technology Partial Zero-Emission Vehicle (AT PZEV) hybrid vehicle.